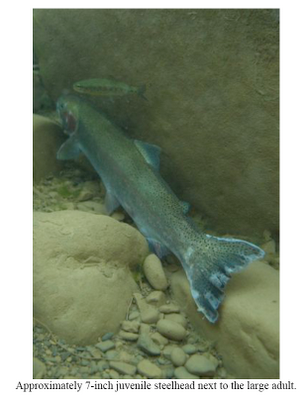 Last week we noted the passage of two adult steelhead through the Robles Diversion Fish Passage. 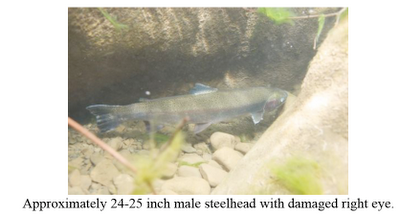 On March 30, 2010, ecologist Matt Stoecker reported Adult Steelhead Below the Ojai Quarry Barriers on the North Fork of Matilija Creek. 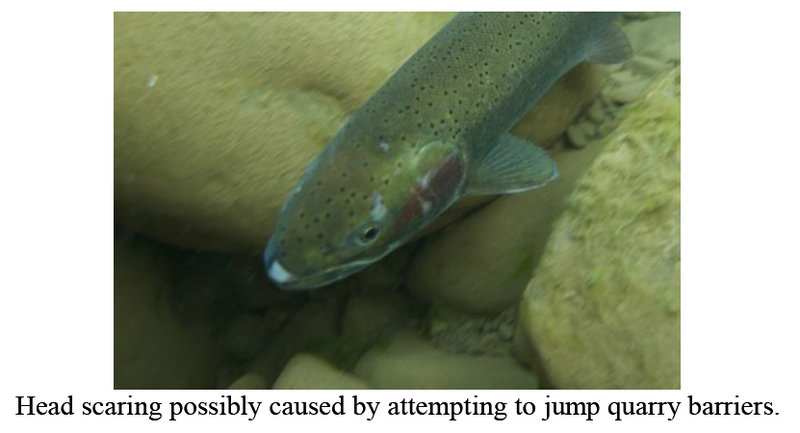 Following the recent good news and video of two adult steelhead migrating up the fish ladder at Robles Diversion Dam many local scientists and watershed groups immediately worried about the impacts of the Ojai Quarry migration barriers in the North Fork of Matilija Creek. 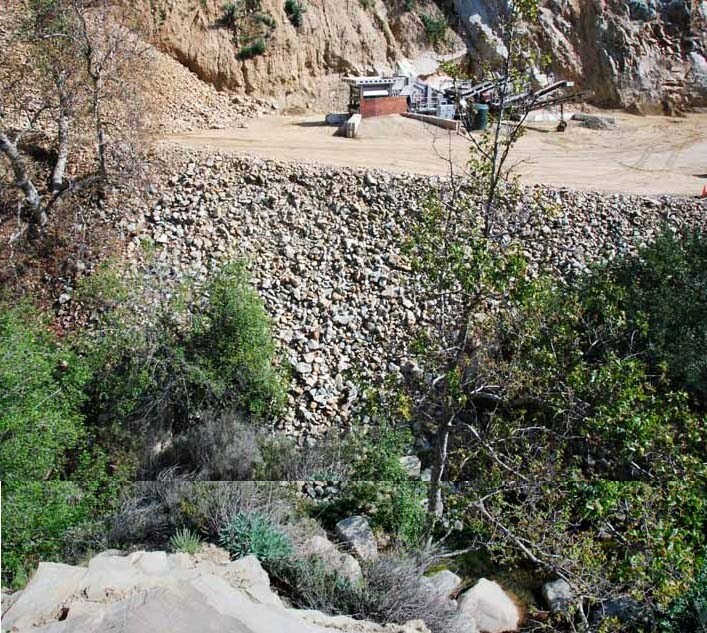 Near the mouth of the North Fo rk several boulder jam barriers, caused by the discarding and accumulation of large boulders, occur at the Ojai Quarry. 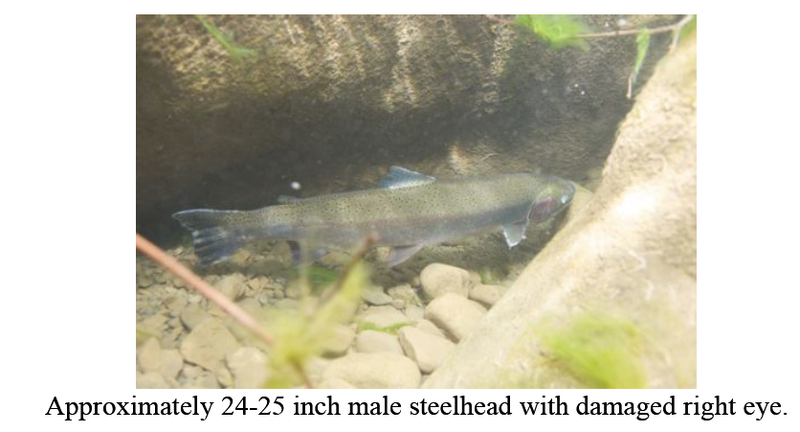 On March 30, 2010, these concerns were realized as two large sea-run adult steelhead measuring between 22-25 inches in length were observed immediately downstream of the quarry barriers where they appeared to be prevented from being able to migrate into the several miles of excellent habitat upstream. 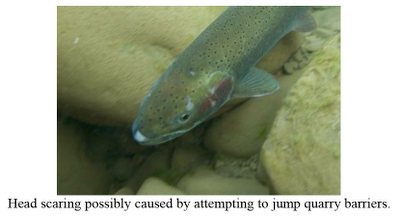 The male had a damaged and dysfunctional right eye and highly scared head that was consistent with multiple unsuccessful jumps at the boulder quarry barrier immediately upstream.These images were taken of the larger (male) steelhead observed. The other, smaller adult immediately hid in a deep undercut and was unable to be photographed. With a multi-million dollar fish passage facility at the Robles Diversion Dam passing steelhead upstream and Matilija Dam removal at least a few years away, providing effective upstream migration into the North Fork of Matilija Creek is critical. Almost the entire North Fork and several miles of high quality habitat are effectively blocked to steelhead migration by the continued operations and migration barriers at the Ojai Quarry.